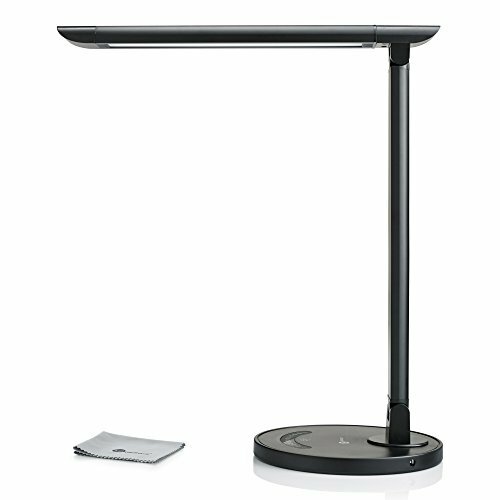 Home › Energy-Efficient LED Lighting › Taotronics Led Desk Lamp Eye-Caring Table Lamp Energy Efficient Led Lamp(12W ..
Taotronics Led Desk Lamp Eye-Caring Table Lamp Energy Efficient Led Lamp(12W ..
Color: Black TaoTronics new generation energy-saving LED Desk Lamps comes with vision-friendly, low power consumption LED light source, adjustable color modes, anddimmable brightness settings, making them ideal for home and office use.Modern Lighting Say goodbye to your old incandescent light and faintlyilluminated working space. Say hello to this elegantly designed, modernlooking and energy-efficient source of lighting for reading / working /studying. Vision Care Designed to blend naturally into any scene, and provideflicker-free and ghost-free lighting that is pleasant and comfortable for youreyes. Even after long hours of use, your eyes will feel less fatigue than withtraditional types of lighting. Adjustable Lighting With a slight touch fromyour finger tips, you can switch between a strong white light to soft yellowlight. 5 different color temperatures and 7 brightness level for you to finetune your illumination. Eco-Friendly This new generation of eco-friendly LEDlighting consumes 75% less power than traditional incandescent lights, whileproviding the same amount of light. This means a smaller electricity bill anda smaller carbon footprint.